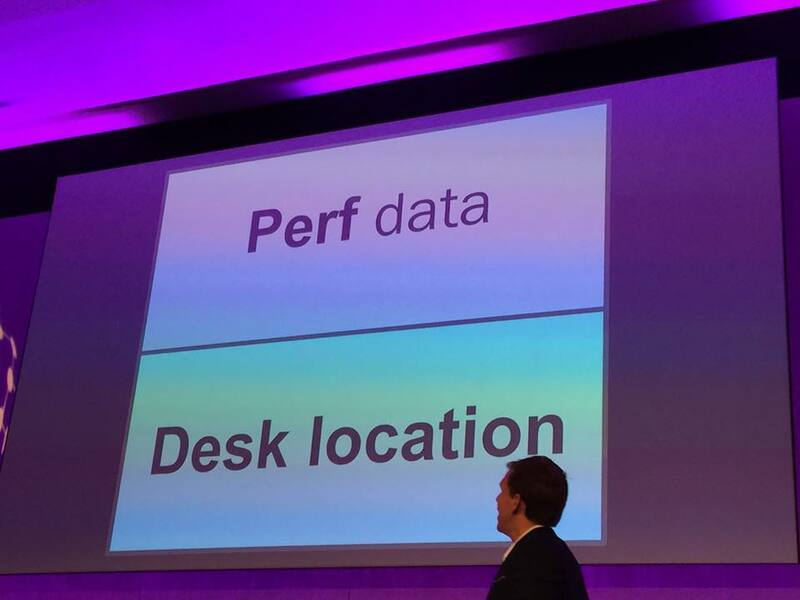 Having spent a week or so reflecting on the #PAWorld17 conference, there is one takeaway that I come back to over and over again; Simplicity. As it turns out, the old saying Keep It Simple Stupid has never been so relevant. Throughout the conference, I found so many parallels between the challenges of developing a great analytics strategy and my own day-to-day challenge back here at Chemistry - developing future products. One of the challenges when developing new products is avoiding complexity in design. When starting anything new, opportunities are endless and often the pursuit of these possibilities can lead you to create overly detailed architectures, which can cause you enormous problems in terms of scale and implementation further down the line. Taking time to pare back the opportunities and understand what you are really trying to do, instead of rushing in full tilt can save you a lot of time and misery. As Blaise Pascal once said, "I have made this letter longer than usual, only because I have not had the time to make it shorter." Alex Levenson touched on this beautifully in his opening keynote. He talked about the importance of stepping back and starting with questions not data. Getting into the business, understanding the "job to be done". It's really strategically important to ensure that you create the right framework to make sure you get to the right problems. This is exactly the same with product development, getting out to customers as early as possible and understanding what their true challenges really are. 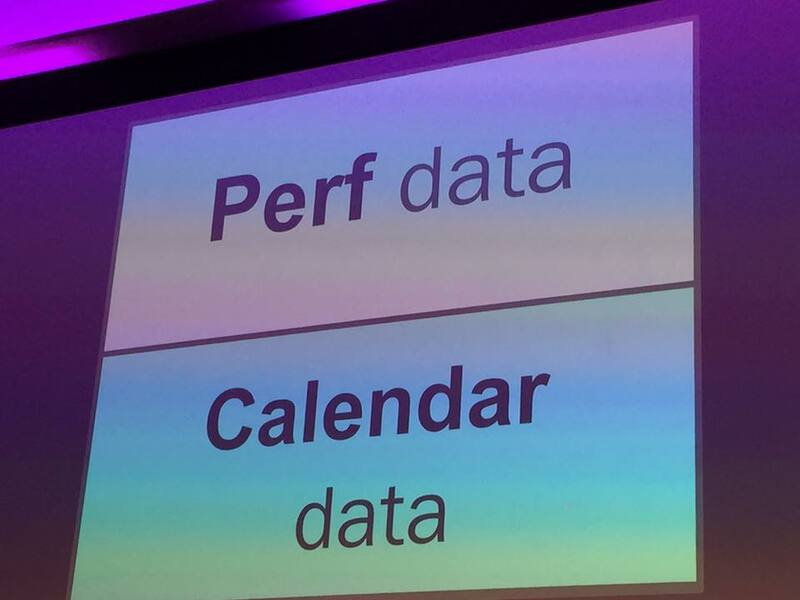 During the conference, there were a few sessions that stood out for me where the simplicity message really hit home. First, we had Stefan Hierl, Director of People Analytics from Adidas running a session called Applied Customer Experience Analytics to Engagement. This was a great session and it was so good to see a leading organisation taking the same methodologies and measurements used for tracking customer experience and turning them inwards, to the employees, something that we should've been doing a long time ago. 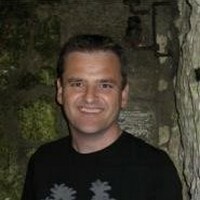 Stefan shared the approaches they use to measure engagement and feedback in real time. What I really liked was the emphasis on simplicity and content. Central to their approach is an Employee NPS score, and a principle of tracking experiences across the key employee “touchpoints” or “moments that matter” as he referred to them - see image. Complex data and dashboards have been de-emphasised in favour of delivering real-time narrative and comments back to the managers and the employees. Their approach is all centred around asking questions and soliciting comments. As Stefan pointed out, an 80-question survey is hardly human! Roger that! 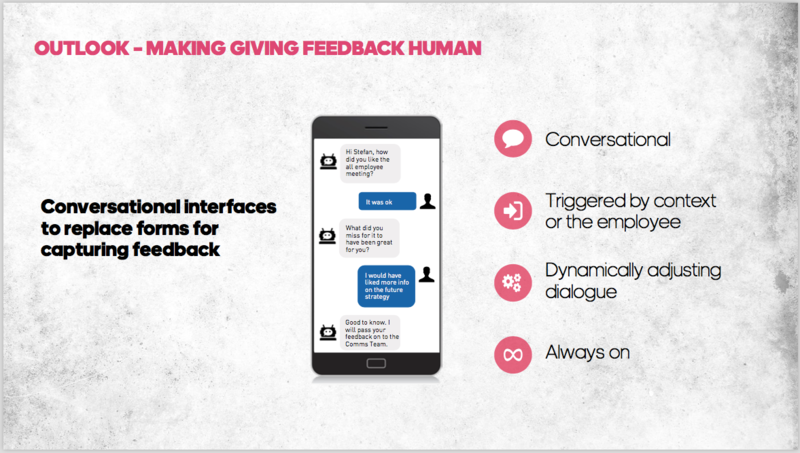 The employee comments, presented in a simple Mobile interface, allows the users to get straight to the heart of the issues. Clearly, they were rolling up the results into the top line dashboard, but they had also spent time really trying to understand what core questions they were trying to answer, as per Alec's advice. I would definitely recommend anyone embarking on a journey of a HR Analytics to jump on the phone and spent some time talking to Stefan. The next session that caught my eye and played on the simplicity theme was the one led by Cole Nussbaumer, founder of Storytelling with Data. Her session focused on using storytelling principles and simple visualisation for maximum impact. What I loved was that she chose to use a very simple Excel chart as an example - no fancy software or hand-crafted dashboard. Just a simple graph. By removing the superfluous – including the all-too-common fancy Legends, shadows, visual effects and data points – she was able to focus the viewer on what really mattered: the message the graph was delivering, rather than its detailed content. 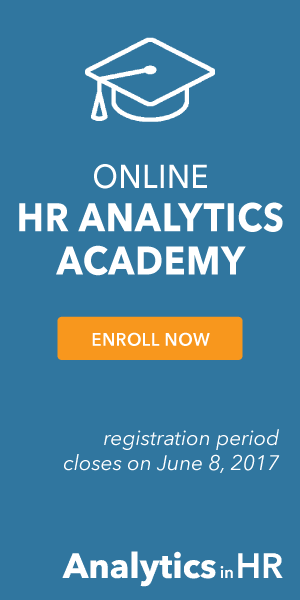 Given that most organisations who are playing around with HR data are using spreadsheets (due in part to the appallingly poor analytics technology landscape – but that's for another blog!) a lot can be learned from Coles tips in terms of making interpretation so much easier for very little investment. The final session that took my eye was run by Randy Knaflic, VP HR and Internal Operations at Jawbone. Randy chose a children's book - Daddy Wrong Legs - as the prop for his presentation. I will leave you to check out the book yourself but the suggestion here was to take two pieces of data that you would not expect to have any form of correlation, or indeed wouldn't think to put together. 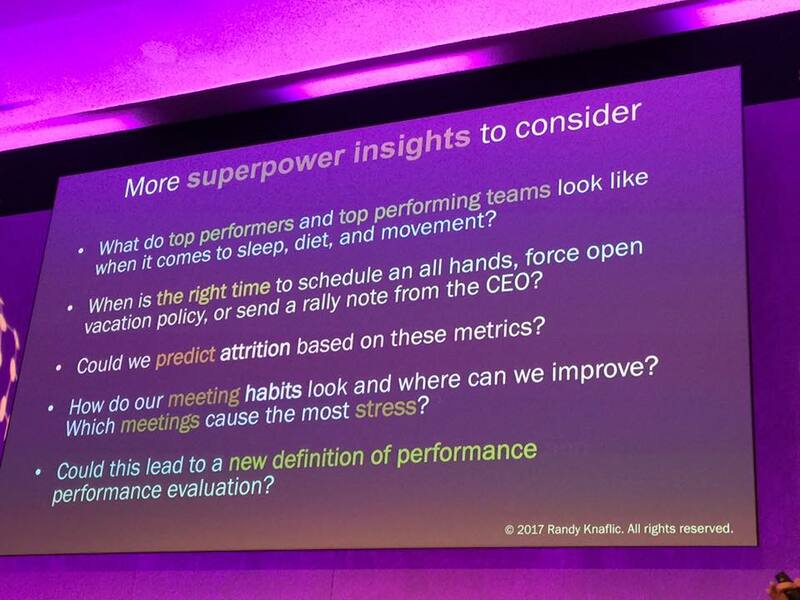 This was a very powerful visualisation technique and Randy went on to share how they had been contrasting classic HR analytics data – attrition, performance, headcount etc. – with, for example, health and well-being data such as sleep, heart rate and steps and other data points like desk location and calendar data. I've shared a few of Randy's slides here, but there were many more, eliciting some fascinating insights into what correlations can be drawn and also proving that taking such an unorthodox yet simple approach was driving some real business benefits. 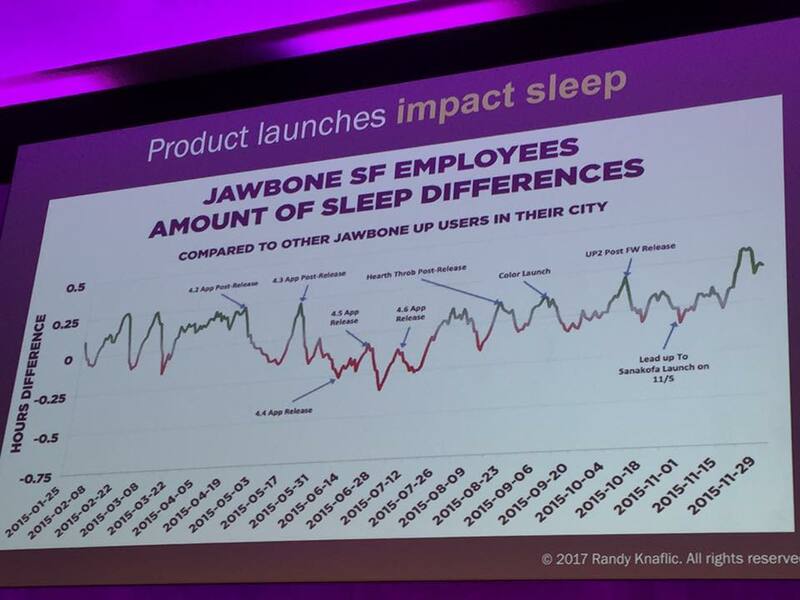 For example, correlating team sleep patterns with product launches helps them consider resourcing implications during product launches. 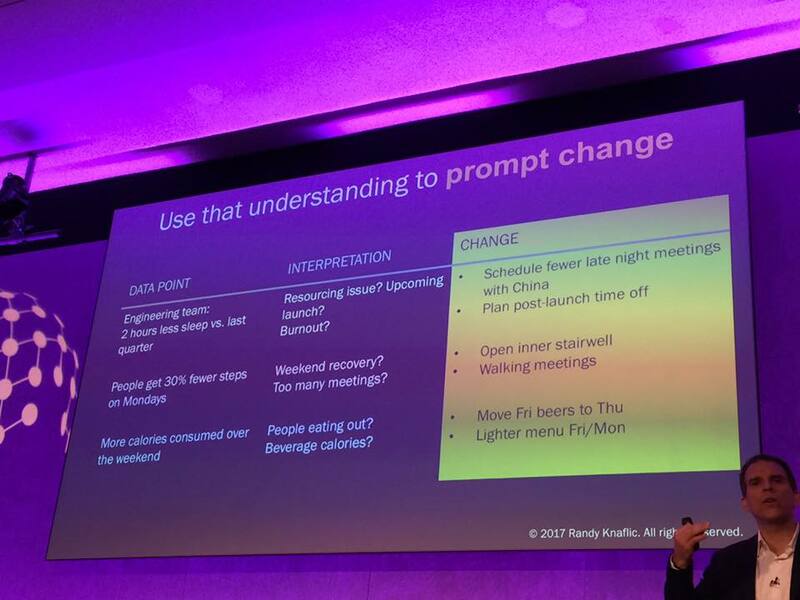 Another looking at the total steps taken by team members on certain days allowed them to question whether they were having too many internal meetings. 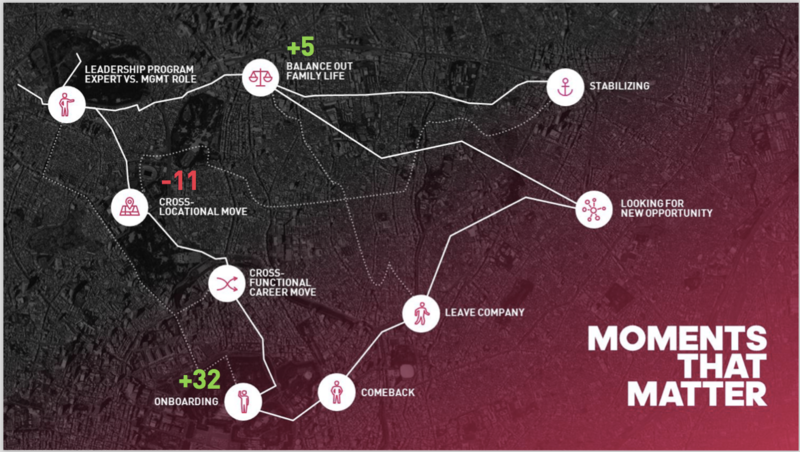 Ultimately of course, accessing employees’ wellness data is a whole new ballgame for many organisations, who are still struggling with getting basic people data onto the map. And then there are the data protection, privacy and ownership issues to consider. Are employees really going to share this kind of data with their employer? Should they be compelled to do so? It certainly raises the issue of trust, doesn't it?! My view is that if we could get past these issues, this kind of insight could actually be of huge value to the individuals themselves. Hard data that allows and empowers employees to show the real impact of working practices on their health and well-being could be game changing. Organisations that don't put employee welfare at the top of their agenda, or as in the case with many, where they pay lip service to it, might want to sit up and take notice. In the future, far from "the quantified employee" being seen as an invasion of privacy of the individual, it could well be the most powerful tool in the employee toolbox to lobby for better working conditions. In my review of day one of the conference I said that it had been a very thought-provoking event and two weeks later that feeling still prevails. I for one shall return next year to see how things are progressing. I encourage you to do the same.